I went in to the dermatologist last week for an annual skin check and, instead of a humiliating, cold, and uncomfortable paper gown, this cotton spa robe was instead waiting for me to change into. My experience of whether I was working with an empathetic and caring physician was shaped before she even set foot in the exam room. 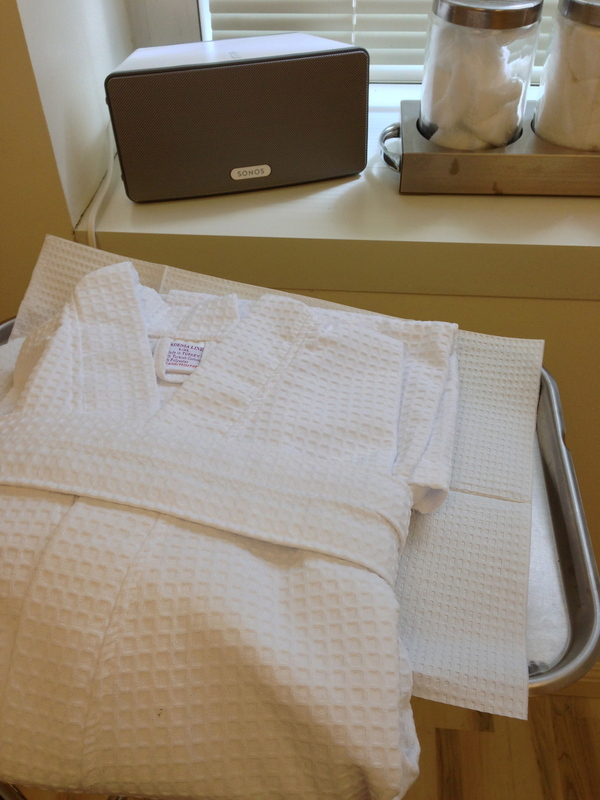 Small touches like this robe can make a dramatic difference in the patient experience. This does not mean that “luxury” can or should replace high-level medical care. However, thoughtful touches like this robe can enhance and augment high quality medical care to make it even better, and we should not ignore these opportunities to make our patients feel more comfortable. I am just finishing up a packed few days at TEDMED 2013 as a FrontLine Scholar. There were over 1,800 people there, from a broad spectrum of occupational backgrounds, countries, skills, and areas of interest within healthcare. This made for an unending cascade of “unexpected connections,” the theme of the conference. Indeed, though there were many engaging speakers who told stories about turning personal tragedies into discoveries and new passions, to me, the real action at TEDMED was away from the conference stage at “The Hive” (set up with booths showcasing innovators as well as comfortable and open meeting spaces). 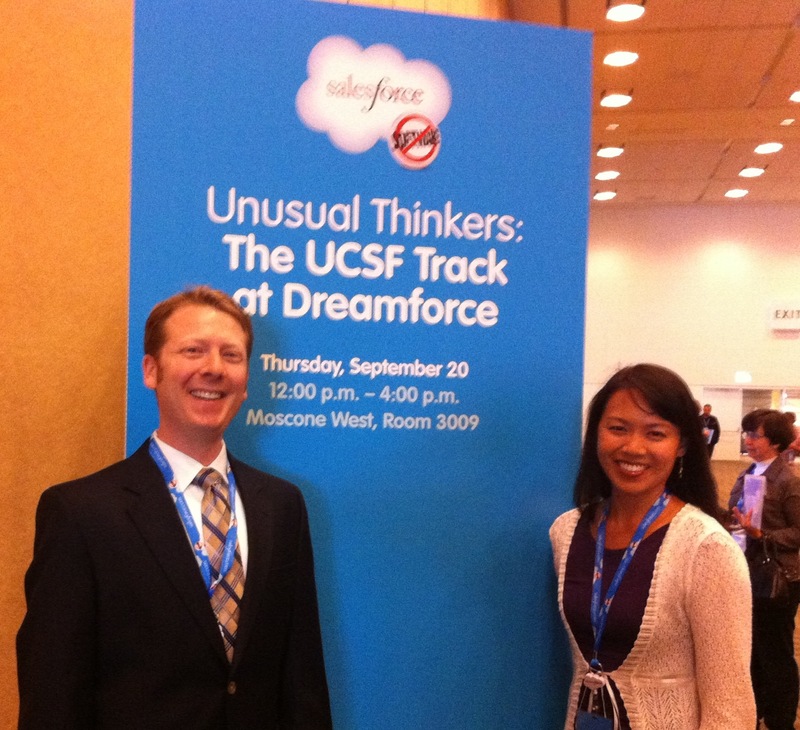 I met dozens of amazing people, with whom I had dozens of thought-provoking conversations. I will follow with another blog post about some of the specific companies that I met and spoke with at The Hive. There is more to write about from 3 1/2 days at TEDMED than can fit in a “short” blog post. Watch your backs! Those entrenched in the current model of the healthcare system need to be innovating and disrupting themselves from within their own organizations, or else risk being out of business in a short number of years. Lip service to change will not suffice. There are many, many companies and innovators taking aim at current models of healthcare, and while most of these companies will fail, and while change may be slow and halting, it will happen. Bottom-up innovation: Change in healthcare cannot come only from the ivory towers and healthcare professionals. As a doctor at UCSF, I recognize that this means me. America Bracho spoke passionately about how innovative ideas should come from within local communities in a bottom-up fashion rather than a top-down manner. We in the healthcare establishment need not only to listen, but to include the people who are most easily able to identify their actual problems and the potential solutions. Interdisciplinary problem-solving: As discussed by Tim Brown in Design Thinking, to creatively and successfully tackle a big problem, an interdisciplinary team is needed. Five doctors sitting in a room are not going to solve a major healthcare problem. We need engineers and patients, designers and artists, marketers and people in finance. We need them to work together. The cross-disciplinary problems in healthcare require cross-disciplinary attention. I was encouraged to see how many talented people with backgrounds outside of healthcare are now turning their attention to solving healthcare-related problems. While some are doing so with a Willie Sutton “that’s where the money is” philosophy, most are truly dedicated to innovating and solving important problems, and we need their energy and their ideas. Courage: Have the courage to ask difficult questions that everyone else is afraid to ask, and to pursue the answers in ways that other people are afraid to pursue. Medication adherence. This was true at the mHealth Summit several months ago and remains true. There is a lot of attention being paid to trying to track, measure, and improve medication adherence. Some of the companies at TEDMED: AdhereTx, AdhereTech, GeckoCap, NudgeRx, RxAnte, and others. There are a number of different approaches being tried, from “smart pill bottles” to reconciling claims data with EHR data. Crowdsourcing. This concept is being applied across different fronts and in different ways. Docphin is creating a social experience around reading medical journals, allowing clinicians to see what the most popular articles are in their field or across all fields. Science Exchange is creating a TaskRabbit for scientific tasks, matching scientists who have a particular skill with those who have a specified task requiring that skill. UpRise is converging all of the patient education materials that they can into one common platform for distribution to patients. Crowdmed is applying the wisdom of the crowd to diagnosing diseases. Roni Zeiger spoke about “networks of microexperts,” allowing patients to share their knowledge and best practices, announcing his company, SmartPatients. Larry Brilliant spoke about infection monitoring tools for public health, like FluNearYou. Psychosocial and behavioral interventions. The companies on this list included Empower Interactive, Healthify, Omada Health, and Sense Health. To quote Mugatu, Will Farrell’s character in Zoolander, mHealth is “so hot right now.” In this spirit, nearly 4,000 people came together for the past several days outside of Washington DC for the 2012 mHealth Summit organized by mHIMSS. For anyone who was sitting at home and playing buzzword bingo during the conference, here are the words that would have comprised the winning row: interoperability, gamification, wellness, big data, social, consumer, adherence, re-admission. 1) mHealth adoption will be consumer-driven. At this point, I think few people question this. 2) User interface and user experience are lacking. Because of point 1 above, user experience and user interface are critical. For something to have durability (or “stickiness”) with consumers, it is going to have to be simple, engaging, intuitive, and heck, maybe even delightful. Most of the current crop of products has work to do here. One up-and-comer in the StartUp Health class that I really enjoyed seeing was designed by a RISD graduate and is called Thryve. I have also yet to see a person interact with the ECG-in-an-iPhone-case, AliveCor, and not get excited. More products need to generate these enthusiastic reactions. 3) We need to use mHealth to solve real problems, and do so in thoughtful ways. Sometimes the trouble with an mHealth app is simply that it wasn’t designed based on a real clinical problem or need. No amount of snazzy UI can fix this. I was encouraged to meet many very intelligent and thoughtful people at the conference who are working hard on big problems and using rigorous, scientific approaches, for example Ginger.io and the team at University of Toronto, among many others. 4) Business models are still being worked-out. There are still not a lot of success stories to guide the industry and everyone seems to be feeling their way around in the dark. One of the proposed business models that seems to be popular is to market a product to large employers as a method for improving employee wellness. 6) Scott Peterson (Verizon): “We cannot allow walls around data to continue.” We need real interoperability. Although the term “interoperability” falls into the “so hot right now” category, this often seems to mean, “I want everyone else to interoperate with me.” I participated with Open mHealth at the conference, who is trying to foster a community towards the goal of true interoperability. Open mHealth recognizes that patients should be the ones to control access to their own data. I hope the rest of the industry catches up to this idea. 7) Physicians need to change. Now. Vinod Khosla famously and provocatively predicts that “80% of the work that physicians do today can be done in the future by computers.” Everyone can waste their time arguing the details, but would be better off realizing that the spirit of this comment is accurate, and instead focus on how to facilitate and shape this transition. This does not mean that 80% of doctors will not be needed. It means that what we do will change. Big data, analytics, and artificial intelligence will be able to do many tasks better than physicians. I, for one, am happy about this… I believe that these tools, when built properly, will make me a far more effective and efficient physician. My colleague at UCSF, Dr. Seth Bokser, told me that he focuses training his pediatric residents on empathy and decision-analytic skills, worrying less about rote memorization and knowledge. He’s right, and medical education should reinforce this. 8) Research techniques are needed that better fit mHealth. There was an excellent panel at the conference where this was discussed by Dr. Joe Caffazzo from the University of Toronto and Dr. Bonnie Spring from Northwestern. The general consensus was that traditional randomized controlled trials (RCTs) are too slow and too expensive, and that by the time they are completed, the technology they are studying may often be obsolete (Dr. Spring gave the example of a recently-completed RCT using a Palm Pilot!). Usability testing and other qualitative methods are important for building a good, user-centered product, but may not provide high-quality evidence for clinical effectiveness. Newer models are needed. 9) Despite being a buzzword, “wellness” actually is important. The current healthcare paradigm focuses too much on treatment of end-stage diseases. In so many cases today, these diseases are all linked by stemming from the milieu of obesity, insulin resistance, and inflammation… heart attacks, strokes, sleep apnea, diabetes, kidney disease… I think that “wellness” as a buzzword grates on people when it is used in the context of the “worried well” obsessing over minor details. But as a US and world population, where the above health problems are becoming overwhelmingly expensive, we really do need to figure out (and soon!) how to promote healthy eating, exercise, and other good lifestyle choices for those who are not yet on board. There was a lot of high-tech, whizz-bang, cutting-edge stuff on display at the conference. And yet every time I looked, at least 90% of the people seemed to be taking the escalators instead of the stairs between conference sessions (reminding me of the below photo). If the 4,000 people in the US who are the most gamified, FitBit’ed, and social networked won’t take the stairs, we must still have our work cut out for us. I’ll admit that I’ve not yet read this journal article to form my own conclusions, but I found the headline interesting nonetheless. Here is a link to the NY Times article and a link to the original journal article in the Journal of Academic Medicine. It makes intuitive sense… if your physician has a higher level of empathy, you are more likely to form a positive treatment relationship, and the patient is thus more likely to find meaningful and useful treatment recommendations from that relationship, and will end up with fewer acute metabolic complications. Definitely adding this paper to my journal article reading list. 1) People are ready for patient empowerment. This sounds obvious, but that is just the point! This is no longer an upstart idea or something that should be argued about, but rather a given, a precondition to any new system or idea. People want to own their health data and it is going to happen, whether or not the medical establishment is ready or desiring. 2) There is tremendous excitement and energy being put into technology in healthcare. There is a seemingly endless number of people with remarkable ideas, passion… and a startup. 3) There is nearly as much trepidation and concern about HIPAA and regulation by the FDA. Though nobody will quibble with taking patient privacy and patient safety seriously, the pendulum has clearly swung too far in one direction and is slowing innovation. 4) Nobody can seem to believe the fact that “this hasn’t happened yet.” To a culture accustomed to upgrading from the iPhone 4 to the 4S to the 5 in the course of 18 months, it is impossible to imagine that a similar pace of innovation has not also happened in healthcare. There is a mixture of surprise, curiosity, and sometimes sad resignation at this fact. It is my belief that this great surge of innovation that I mentioned above in bullet 2 is building up behind a dam, waiting for a few structural changes in healthcare policy and economics to occur before it bursts through.